This is a terrific lens for the money. I got mine new in a two-lens package with the Tamron 28-80 lens for under $200 on eBay. I use L glass exclusively for my own telephoto work, but I bought this lens for my girlfriend to use on my backup camera, a Rebel XT. The build quality was better than I expected. It feels solid and features a metal mount. The autofocus is slow, noisy, and prone to hunting, yet the lens has able to track motorcycles at numerous Canadian Superbike races (see examples in sample images below or go to the Canadian Superbike 2006 gallery). I find the lens to be pretty sharp even at 300mm wide open (see 200mm test, 300mm test, and 100% gull crops at f/5.6 & f/8 in the lens test gallery). Also, the 1:2 macro is a great added feature and works quite well (see the butterfly in the sample images). 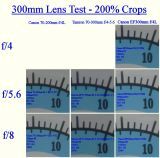 The drawbacks are that images are less sharp near the edges, small maximum aperture, and the lens is prone to producing a considerable degree of chromatic aberration in high contrast situations (this is noticeable in some of the test and sample images). Overall, however, I'm impressed with this lens. It provides a good range, decent reach, and surprisingly good performance for the money. I think it's worthy of serious consideration as a first DSLR telephoto lens for someone starting out with a modest budget. Thank you very much for your fine test and pictures. I have bought this lens from Ebay for $80+delivery in mint condition and now (im)patiently waiting for it. Your article confirmed my believe that using proper settings this lens can give excellent results. I will mostly be doing wildlife/bird photography,so will this lens be useful given that it doesn't have image stabilization?